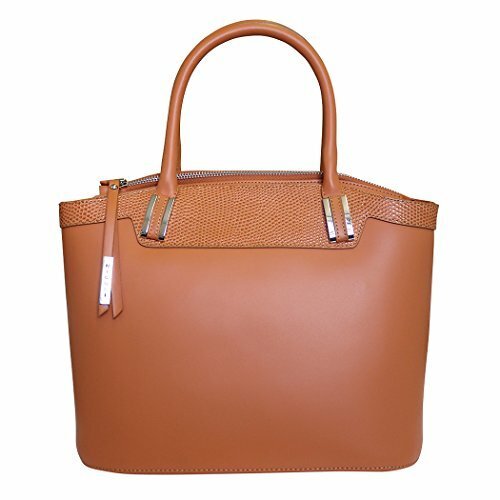 Nicoli 'Eleganza' tote grab bag, designed and made in Italy by craftsmen in Italian leather. This beautiful structured bag is made in fabulous quality Italian leather and has been brought up to date by adding a top band of embossed leather. Silver coloured hardware attaches the two top handles to the body of the bag and a dangling strap and logo fob complete this stylish bag. A single top zip closure reveals plain lined two compartments, a wall zip compartment on one side and a phone pouch the other. 5 studs on the underside protect your bag. A stunning bag to add a touch of class to your outfit for that special occasion.